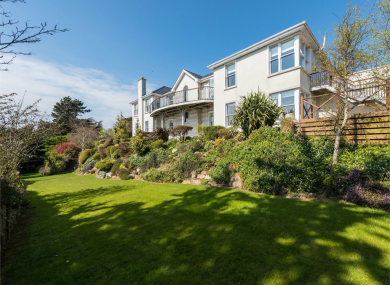 A five-bed property with incredible views of Dublin Bay. MORNINGS AT BRAMLEY Hill – situated in Dublin’s coastal town of Howth – must be quite a treat. The house, which is on the market for €3,500,000, has breathtaking views of Dublin Bay, and the perfect deck from which to enjoy them. It’s not just the panoramic vista of the bay that you get with this house, though it’s certainly one of the main draws. The impressive architect-designed property was built in 2000, so it’s crammed full of modern features. The focus when designing contemporary homes tends to be in getting as much light as possible into the building, and that was clearly the mindset of the architects here. Large windows and double-doors work with the house’s neutral palette in keeping it light and bright inside. Bramley Hill is located on a private road which is shared by a small number of other properties. Green fingers will enjoy the 1.16 acre gardens, which include flat manicured lawns and secluded wooded area. Howth is a famous seaside village for a reason, and living nearby means easy access to its lovely restaurants and bars, nearby yacht club and marina, and the gorgeous views of the sea. Plus, it’s just 18k from Dublin City, so you’ve the joy of the country but without being too far from the spoils of the city. On a good day, you can take a walk up Howth Head, or wander further up or down the coast. With five bedrooms, a south-facing view from all rooms, a fully-fitted kitchen with mod cons, and lots of other little touches, this is a home that requires little from its new owners to make it a comfy family abode. Bramley Hill is for sale for €3,500,000 through Gunnes. Email “View of the week: Sitting on the deck of the bay”. Feedback on “View of the week: Sitting on the deck of the bay”.